So far in my series of posts on the arguments contrarians make against global warming, I’ve written about the changes being observed in the Earth’s climate. I wrote about whether the global temperature has increased (short answer: yes); whether it has recently stopped increasing (short answer: probably not); and whether ice is declining around the world (short answer: yes). Now I figure it’s time to go back to where it all begins: with CO2 and the greenhouse effect. Claim: The greenhouse effect does not exist. Fact: The greenhouse effect is as established a phenomenon as any. It was first discovered in the 1820s by French mathematician Joseph Fourier, and the basic physics was essentially understood by the 1950s. Greenhouse gases are completely transparent to visible light but less so to infrared. Visible sunlight is transmitted through the Earth’s atmosphere and warms the surface, causing Earth to emit infrared light (because Earth is much cooler than the Sun, its radiation peaks at a lower wavelength). But on the way out, some of this radiation is trapped by greenhouse gases, which reflect it back to Earth and make the surface warmer. If it were not for the greenhouse effect, the Earth’s average surface temperature would be about 33°C colder. Claim: CO2 is not evil/not a pollutant. Fact: The “straw person” fallacy is committed when one (intentionally or otherwise) misrepresents the argument one is attempting to counter. “CO2 is not evil” could be a textbook example. Of course there is nothing inherently evil about carbon dioxide — but nobody is claiming that there is. It’s just another molecule. In the context of climate, the important property of CO2 is that it is a greenhouse gas which plays an important role in regulating the Earth’s surface temperature. A number of other greenhouse gases contribute to the problem of global warming, including methane (CH4) and nitrous oxide (N2O), but carbon dioxide (CO2) is the most important. This may not be pollution in the direct sense of contamination, foulness, or impurity; but it does indirectly change the environment. Stable CO2 levels help keep our climate in the delicate balance it is in, and humans have altered that balance. Claim: The CO2 greenhouse effect can’t be increased. Claim: Water vapor is the most important greenhouse gas. Fact: Although water (H2O) is indeed the most important greenhouse gas, it is unlike other greenhouse gases in that it cannot be added to or removed from the atmosphere (I’m talking on climatic scales here, not day-to-day weather). The amount of water in the atmosphere is determined by the air temperature: the warmer the air, the more water it can hold. In this way, H2O acts as a positive feedback which amplifies warming caused by other factors such as CO2. This feedback has been observed in satellite data of atmospheric moisture over the oceans. So far from diminishing the role of CO2, H2O actually enhances its effect. One implication of a warmer atmosphere is more evaporation and more precipitation, causing both extremes of the global water cycle to intensify. This means wet regions are getting wetter and dry regions are getting drier, causing worse floods in some areas and worse droughts in others. For example, over the last 50 years, rainfall has increased in mid-latitudes but decreased in the subtropics. In fact, it’s happening faster than predicted. Ironically, more precipitation also means an increase in snowfall in colder areas, adding more ammunition to the “cold weather” contrarian argument. We can expect all these trends to continue. The Copenhagen Diagnosis estimates that global rainfall will increase by about 5-10% per °C of warming. Claim: CO2 lags temperature in the ice core record. Fact: This is true, but it doesn’t mean what contrarians think it means. During the past 2.6 million years (the Quaternary period), the Earth has been in an ice age, alternating between glacial periods where ice sheets covered much of northern Eurasia and North America, and brief interglacial periods like today. The warming during the transition to interglacial periods (deglaciation) is much more rapid than the cooling during the transition to glacial periods (glaciation).The current interglacial period (the Holocene epoch) has lasted about 12,000 years. Unfortunately, Gore failed to explain what this correlation meant, giving the impression that the CO2 changes were the primary cause of the temperature changes. In fact, as contrarians were quick to point out, this couldn’t be correct as CO2 actually lagged temperature by up to a millennium (we don’t know the exact timing as it is difficult to match up the two records). I accept that scientific explanations aimed at laypeople will never be 100% accurate (and I’m sure my explanation below is no exception). But An Inconvenient Truth gained so much publicity that contrarians have combed it for errors, and used whatever they find as ammunition against global warming. By simplifying the relationship between CO2 and temperature, Gore made their job a lot easier. Here’s how it really works (as we currently understand). The glacial and interglacial periods are caused by periodic variations in the Earth’s orbit called Milankovitch cycles, first proposed by Milutin Milankovitch in the 1920s and confirmed by the first reliable paleo-temperature data (from ocean sediment cores) in the 1960s and 1970s. The cycles include precession (19,000 and 23,000 years), obliquity (41,000 years), and eccentricity (100,000 and 400,000 years). The 100,000-year cycle has dominated for the last million years or so. But the Milankovitch cycles alone cannot explain the rapid warming seen during deglaciations. What actually happens is that the Milankovitch cycles cause Southern Hemisphere temperature to gradually increase until it reaches a “tipping point”, when large amounts of CO2 are released by the warming southern oceans. CO2 amplifies the warming and spreads it from the Southern Hemisphere to the entire planet. The whole process takes centuries due to the sheer vastness of the oceans. A comparison with Greenland ice cores and tropical ocean sediments shows that indeed, temperatures in the Northern Hemisphere also lag behind the Southern Hemisphere. Each deglaciation took millennia to occur, and although CO2 may not have caused the first few centuries of warming, it certainly contributed to the rest of the warming. (Another important feedback is that the growth of ice sheets increases the surface albedo.) In fact, the CO2 feedback is necessary to explain the full extent of the warming. You may be surprised to learn that it was actually predicted 20 years ago, before ice core measurements were detailed enough to detect it. So it’s not exactly a skeleton in the cupboard of climatology. 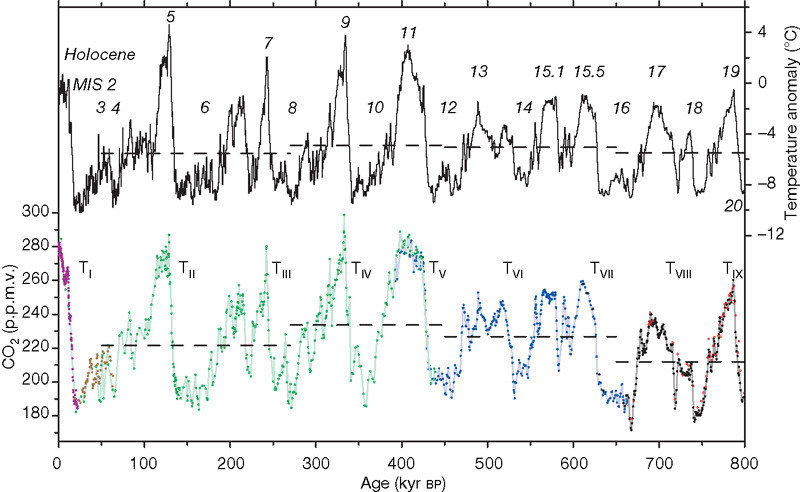 The current climate change is different to the Quaternary glacial-interglacial cycles. Today, a lot of CO2 is being added to the atmosphere at once and is a primary cause of the temperature rise. In Part 5, I’ll talk about how we know all this CO2 is being emitted by humans and is causing the observed warming. Update 20 April 2010: A CSIRO study of changes in ocean salinity since 1950 provides further evidence of an intensified water cycle. The researchers found that regions characterized by rainfall are getting less salty (ie. rainier) and regions characterized by evaporation are getting saltier (ie. less rainy). These changes are not only occurring at the surface, but are also filtering through to subsurface waters.